Dutch death metallers ANTROPOMORPHIA premiere new song ‘Fleisch’ on MetalSucks.net! New album ‘Evangelivm Nekromantia’ out October 19th! 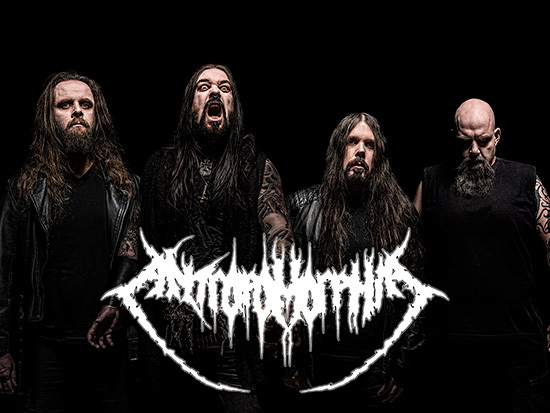 Dutch death metal cult act AntropomorphiA have partnered with renowned metal blog, MetalSucks.net, to premiere their latest single, Fleisch. The song is taken from their forthcoming full length album, Evangelivm Nekromantia and can be heard exclusively HERE. Recently, AntropomorphiA shot a video for Psuchagogia in Leizpig, Germany. The clip was directed by renowned video producer Maurice Swinkels. The video is scheduled to launch within the next week, and until then, fans can head to www.metalblade.com/antropomorphia and listen to Psuchagogia, as well as pre-order the album. Evangelivm Nekromantia will be released October, 19th/22nd via Metal Blade Records in Europe on CD and LP!